Back in June my family planned a vacation to the Chicago area. I was given free tickets to the attractions that we visited to help facilitate this blog post but I was not given any monetary compensation, all opinions are 100% my own. Our trip was sort of an end of school and beginning of summer vacation celebration for us. We also visited the city of Schuamburg, IL. I quite liked the area of Schuamburg, it was really pretty. I must admit that as soon as I'd heard there was an IKEA nearby I got really excited! I am all about shopping in IKEA and I made sure we popped in to buy some goodies when we were in the area. If you are in the area it's a fun place to shop and they have free childcare for potty trained age and up! 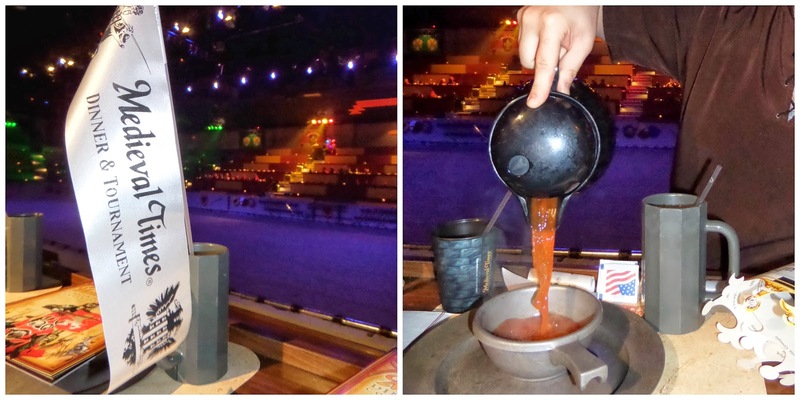 Our first point of interest was the Medieval Times castle in Schuamburg, IL. If you have never heard of Medieval Times then let me start by telling you a bit about it. Medieval Times takes place inside of an 11th century style castle. There are jousting tournaments, authentic armor, hearty and delicious foods that you eat without utensils, horses and so much live action you jaw will drop! The knights jousting and sword fighting was very realistic, the actors do an outstanding job of getting the hair on your arms to raise. Our favorite part of the meal was the roasted chicken. They give you a whole half of a small chicken! The amount of food you get to eat is crazy, you may wish to wear extra loose and comfy clothing because you will be full. Two drink refills of soda were included in our meal, alcoholic beverages were extra. My husband and I both had an alcoholic beverage when we first arrived and the price was reasonable. My camera ended up dying halfway through and so I did not get a good picture of the food but I guarantee it is delicious. 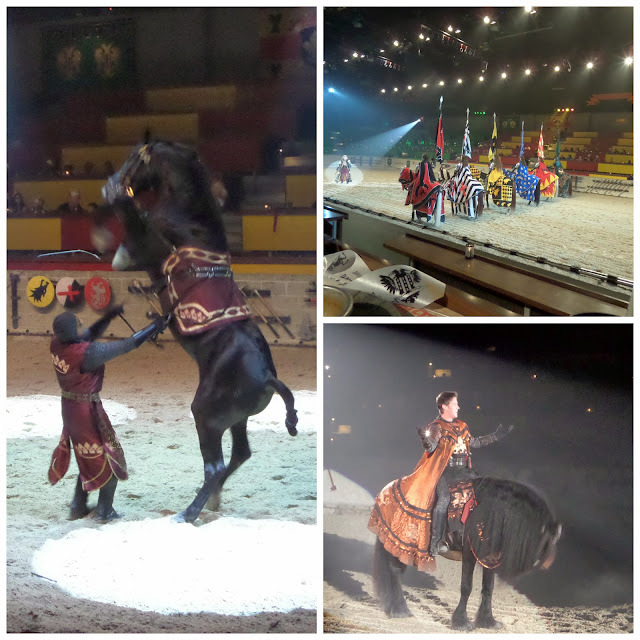 The horses at Medieval Times were magnificent beauties. I could tell that they were very well cared for and trained. As I said before, my camera was dying and so my photos ended up blurring. We walked out at the end of the show feeling excited and amazed! Once you exit if you wait around in the area just outside of the doors you can meet the cast which included the king, the knights and a few others. They sat on thrones and people were allowed to get pictures with them. Some women even got a little bit frisky and sat on some knight laps for their photos. If you wish to buy souvenirs then you may wish to shop at all the gift shops inside the castle, there were many. After our show we drove to a Motel 6 in Arlington Heights. The price is right and they had wi-fi for a few bucks, free coffee plus kids stay free. The staff was very friendly and courteous. Our room was immaculately clean and tidy. I was completely blown away! 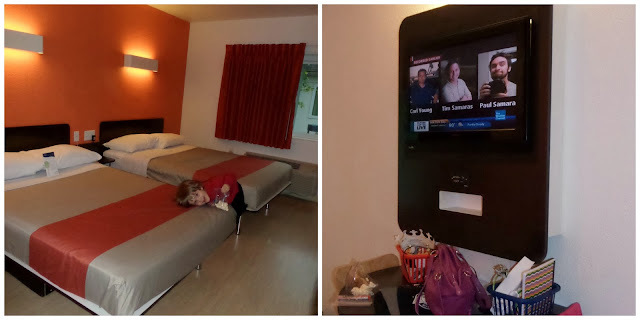 The beds were extremely comfortable and I slept better than I do at home. The Motel 6 we stayed at had been renovated and remodeled, it was gorgeous. The bathroom was very spacious and bright will all new granite countertop, it really sparkled. Every room has a 32" LCD flat screen TV with AV connection for gaming. I definitely recommend staying there if you want to save your money. My next blog post about our trip to Chicago will be about the Shedd Aquarium and a foodie hotspot so stay tuned for that!